This Friday, Australia solemnly mourned its war dead by drinking excessively, gambling and most importantly glorifying war. I’d like to thank all those who posted “lest we forget” on social media for reminding everyone to pour some out for the fallen before they smash that schooner glass over some bloke’s head. On the topic of outdated traditions, The Royals have been in town, charming Australia with their down-to-earth mix of awkward waves and forced smiles, all-the-while providing an educational example of the pitfalls of inbreeding. Some might suggest this is a meagre return for the $2million the taxpayer footed for the 10-day trip (that ended on Friday) especially in these times of supposed austerity, but I say bring them back them ASAP. They are exactly the kind of glitzy smoke and mirrors we’ll need to distract us when we’re all working till 70 or trying to survive without the disability pension. One man who it doesn’t seem will be losing his pension is ex-NSW premier Barry O’Farrell who resigned last week after a thank-you note sent to AWH CEO Nick Di Girolamo for a $3000 bottle of Grange – a bottle that Bazza told the ICAC enquiry he never received – suddenly emerged. Despite resigning, O’Farrell continued to claim ignorance describing the situation as “a massive memory fail”. Cynics may say this is just an attempt to avoid perjury charges but just last weekend after I awoke on a cold kitchen floor with a splitting headache I was regaled with tales of my adventures with a bottle of wine I don’t remember purchasing or drinking for that matter. Sure, it was only a $2 bottle of cleanskin Shiraz batch X8719, but other than that I’m sure Bazza’s situation was very similar. 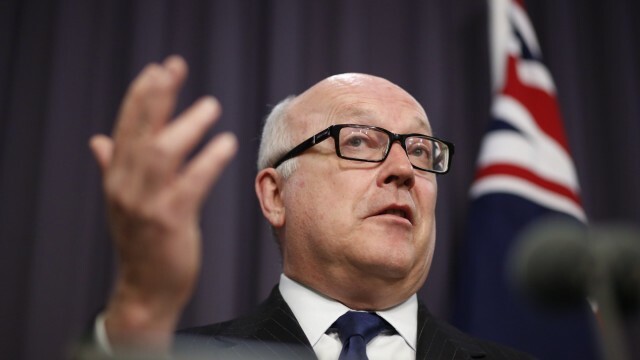 Master of comedic irony George Brandis has been at it again this week labelling supporters of evidence-based climate change science as “ignorant” and “medieval” for refusing to engage in debate with water muddiers, the climate change deniers. Brandis, who was pushing for increased surveillance last we heard from him, then went onto invoke George Orwell in defence of his now infamous “right to be bigots” comment. Part of me is beginning to think George Brandis is actually an elaborate Andy Kaufman-esque performance art piece. Either way, long may the big GB continue to hide my deficiencies as a writer by all-but writing the punch-lines for me. In international news, Russia and The West have continued their high-stakes staring contest over Ukraine, with US ambassador to the UN Samantha Power claiming actions by pro-Russian militants in East Ukraine had “the tell-tale signs of Moscow’s involvement.” Presumably her certainty about the topic comes from its resemblance to the operations the CIA have been so fond of over the years. Despite a peace agreement being reached in Geneva, the occupation of government buildings and outbreaks of violence have continued in Eastern Ukraine. Russian foreign minister Sergei Lavrov responded to one shootout by accusing Ukrainian authorities of “not even lifting a finger, to address the causes behind this deep internal crisis in Ukraine,” while somehow managing to keep a straight face. Barack Obama and Vladamir Putin both spoke of “consequences” after Ukrainian special forces resumed operations outside Sloviansk. As the situation continues to escalate, I become more and more nostalgic for those simple days of 2012 when the end of the world was just kooky theory instead of a glowing, irradiated possibility. Michael Burrill is a 24-year-old writer and contrarian. His hobbies include cheap Australian lager and existential dread.